(London, 1928. Sangorski, Alberto. Small quarto. 33pp. Signed by Alberto Sangorski. A unique manuscript on vellum, designed, illuminated, and calligraphed by Sangorski. A stunning work containing the title poem and five others: "To the River," "Dream Land," "The Sleeper," "To One in Paradise," and "Fairy Land." With an illuminated full-page frontispiece portrait of Poe elaborately framed in a colorful floral border with cherubs at each corner. The title-page is decorated with a large initial "A," the open portion of which frames a portrait of Annabel Lee, and a full border in burnished gold. The manuscript also contains four full-page illuminations and three half-page or smaller illuminations; sixteen large initials, some with full borders and others with intricate border extensions in gilt, blue, green, white, and black; and twelve similar small initials. Leaves separated by silk guards. In an exquisite binding of full morocco by Riviere and Son, studded with a total of thirty-five jewels including twenty-four seed pearls, seven rubies, and four amethysts. The upper cover features a sunken ovular panel of green morocco, and on top of this a three-dimensional onlay of brown morocco in the design of an eagle, the eye of which is formed by a small ruby. 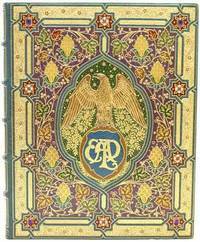 The eagle is perched atop a brown and turquoise shield bearing the author's initials in gilt. The green background panel is decorated with a field of gilt stars at the eagle's head and an intricate floral design, also gilt, spreading out below the eagle's wings. The remainder of the front cover is decorated with a floral pattern of brown, green, yellow, and red morocco against a purple background. An outer border contains a flower-and-vine design amid dense pointillé within ten panels of intersecting strapwork. The panels are demarcated with ten evenly spaced onlays of red morocco, which are set with the various jewels, the four largest, the amethysts, at the corners. 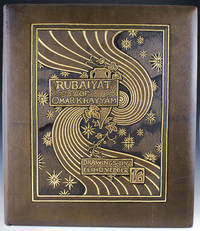 The back cover features an oval center piece of turquoise morocco, lettered in gilt with the titles of the six poems. This is set within a narrow framing device of brown morocco, which in turn is framed by a large ovular inlay of turquoise morocco adorned with maroon and blue flowers. The whole is set within a red morocco frame intricately gilt decorated with a repeating flower-and-stem design and elaborate corner pieces of purple, yellow, green, and blue morocco. 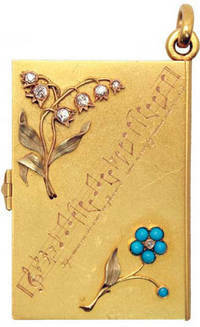 Spine in six compartments, gilt lettered in two and with floral design amid pointillé in the others. Light brown morocco doublures with an interweaving floral and strapwork border of variously colored morocco inlays. A.e.g. All in all, this is a gorgeous work of the highest artistry and craftsmanship both inside and out, similar to the Keats volume created by the same team. Extremely fine in a green morocco box, the spine of which is separated from the box's bottom compartment, and which shows some rubbing to the leather and one small closed tear. (Ratcliffe 78).